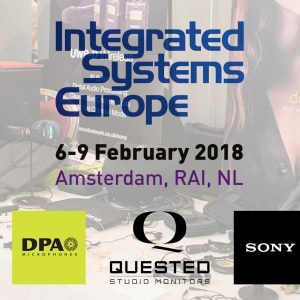 Meet us at the ISE show in Amsterdam from 6-9 Feb and catch the latest pro audio news and gear from DPA Microphones, Sony Pro Audio and Quested Monitoring Systems. Founded by Roger Quested in 1985, Quested Monitoring Systems has made something of a strong comeback in the UK and abroad, with new improvements to their extensive product line coming through quick and fast. Visit them on stand 7-V222 at ISE2018 for a chat and to catch up on the latest developments. Supply in the UK has been boosted with the addition of northern and southern Quested Supercentres – Red Dog Music in London and Studiocare Professional in Liverpool. Read more on PSNEurope here. Get up to speed with Sony Professional innovation at ISE 2018. They’ll be showcasing their industry-leading solutions which harness technical innovation to deliver crystal clear audio, ultra-real images and improve understanding between students, customers and co-workers. Chat to us about Sony’s new DWX3 3rd Generation Digital Wireless solutions and if you’re interested, the brand spanking new C-100, ECM-100U and ECM-100N mics. Contact us on +44 (0)20 3008 7530 or email us if you would like to arrange a meeting at ISE2018.